With Christmas less than a week away, it's time for my seasonal post. Think of it as SWM's equivalent of those cheesy Christmas shows the networks drag out year after year. 'Twas the night before Christmas at Argonaut's house. Argo logged off with a click of the mouse. And now what to do for the rest of the night? And put on his Christmas with Elvis CD. As strains of "Blue Christmas" were filling the air. Then he sat upright again in surprise. What's that? he wondered. What's going on? For he clearly heard footsteps out on the lawn. He beheld ... Could it be? ... His eyes opened wide. Was a beauty whose hair fell in ringlets of gold. And her blouse, like her eyes, was a deep, vivid blue. Argonaut saw a familiar red "S."
For he knew right away it was KARA ZOR-EL. Ignoring the cold he was letting inside. And in through the window she came in a bound. And giggled as Argonaut stood there agape. A flat little box, about six inches square. Coming next year to a theater near you! "And now," said the damsel, "I bid you adieu. And SPULO and BERKHART and ACE and MARKNEW!" She sprang through the window and into the sky. "Happy Christmas to all! 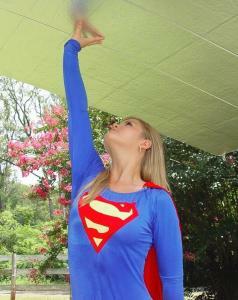 Up, up and away!"